Construction of the €5 million Harley’s Street Pedestrian & Cycle Bridge, linking the city centre and Victorian Quarter, is to start this month. It’s expected that when fully operational, up to 11,000 pedestrians and cyclists, travelling between the city centre and the Victorian Quarter daily, will benefit from the improved connectivity and convenience provided by Harley’s Street Bridge. The Victorian Quarter includes Mac Curtain St and the surrounding area. 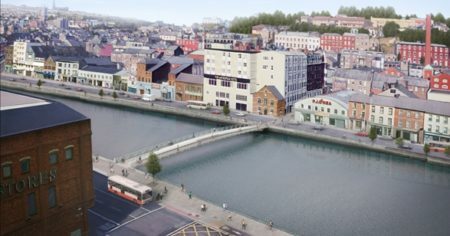 Cork City Council has awarded the contract for the construction of the bridge to L & M Keating Contractors. L&M Keating operate nationally and internationally and recently completed local projects such as the re-development of St. Angela’s College on St Patrick’s Hill and Perrott’s Inch Pedestrian Bridge at University College Cork. Construction activity will commence in mid to late July with the initial phase of work consisting of site set up and diversion of underground utilities. The bridge itself will be fabricated off site by Thompsons of Carlow between July this year and February 2019. Bridge sections will be transported by truck to the lower harbour for final assembly and finishing. The finished superstructure will be placed on a barge and transported by river to the city centre. The barge journey will be timed to coincide with the optimum tide level for clear passage under Brian Boru Bridge before arrival at its final destination in the city centre in April 2019. The bridge will be lifted by crane from the barge in one overnight operation which will require the complete closure of both quays for the duration of the lift. Two lanes of traffic will be maintained on St Patrick’s Quay with minor restrictions for bus and private parking to facilitate traffic flow around the bridge site. Cork City Council would like to thank the project sponsors, The National Transport Authority & Southern Regional Assembly for their ongoing support for the scheme. Cork City Council also want to thank our many stakeholders including local business, Bus Eireann, the public and the many public & private bodies that have contributed to the delivery of this new piece of transportation infrastructure for the City. A process for selecting a formal name for the bridge will be advised later this year.